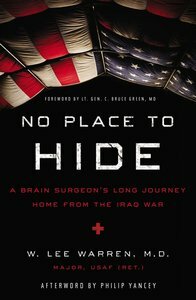 Dr. Lee Warren's successful life as a neurosurgeon specializing in trauma began to unravel long before he shipped off to serve the Air Force in Iraq in 2004. By the time he traded a comfortable if demanding practice in Texas for a ride on a C-130 into the combat zone, he was already reeling from months of personal struggle. When Warren landed at the 332nd Air Force Theater Hospital at Joint Base Balad, Iraq, he realized his experience with trauma was just beginning. In his 120 days in a tent hospital, he was trained in a different specialty---surviving the threats and trying desperately to repair the damages of a war that raged in and around every detail of every day. Whether you are in the midst of your own crisis of faith, failed relationship, financial struggle, or disease how you respond determines whether you survive---spiritually, emotionally, and, sometimes, physically. No Place to Hide is one example of how a person can go to war and come out stronger, not just as a survivor but also as a conqueror. This story is the beginning of a long journey home. About "No Place to Hide"